Conspiratorial -- a follow-along mystery set in Washington, D.C. Originally published as a four-part serial mailed out over several months, Conspiratorial is now available all at once — like binge-watching House of Cards, except this story takes place far on the fringes of Washington, and there are clues for you to follow along. When out-of-work reporter Yuri Realman is approached by a government employee with crackpot-sounding conspiracy theories about a plot to control the world's resources, he is initially skeptical. But as evidence mounts, the two are plunged into a dangerous game of intrigue and Realman is forced to admit that his mysterious new friend may really be onto something. Following a trail of clues and curiosities through Washington, D.C., the pair eventually track a shadowy group of men to a deadly meeting in San Juan, Puerto Rico. It's a fun read that challenges the reader to examine the clues along with the heroes. Each envelope comes with one issue and high-resolution photographs of the clues being discussed. This purchase includes the entire four-issue story, a novella-length 20,000-word serial. If you like noir, this is for you. Addictive and engaging. A great read! 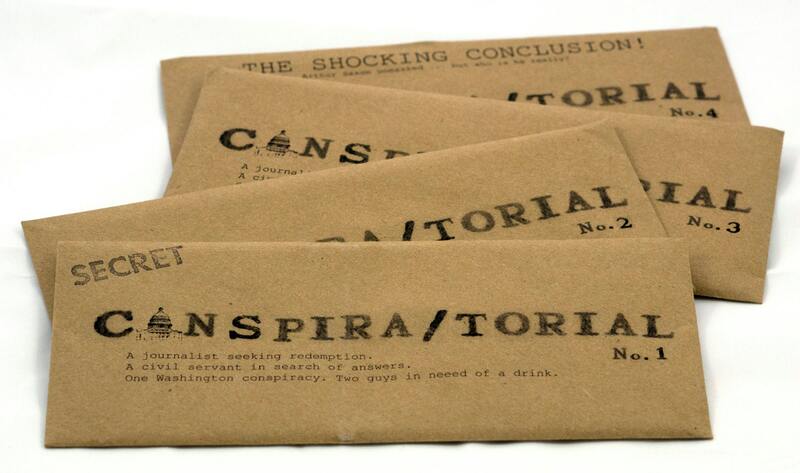 Conspiratorial Issues #1-4 -- a mystery zine set in Washington, D.C.
Fast shipping! I've enjoyed all your zines, thanks so much for sharing your vision! Love it! Another to add to my collection. Fast delivery too. Thank you for sending so promptly. Safely received and in good time.